The American Leather Gibbs High Leg Queen Comfort Sleeper feature traditional style and timeless comfort in one pretty package. Marked by elegantly rolled arms, tasteful wooden legs and deep cushion seating, the Gibbs makes a great addition to any sophisticated decor. But the Gibbs is more than just a sofa. The Gibbs comes equipped with one of the best sleeper mechanisms on the market. The patented Sleep System includes no bars or springs, rather utilizes a wooden platform to provide support and prevent sagging. A new Generation VIII Comfort Sleeper, the Gibbs is built using streamlined design, removing color match flaps and replacing them with UV printing. The Gibbs is available in countless designer fabrics and seven distinct sizes. Click “Get a Quote” to start designing your ideal Gibbs now! This is a next level sleeper. If you just want a cheap pull out bed, this is not the right sofa for you. 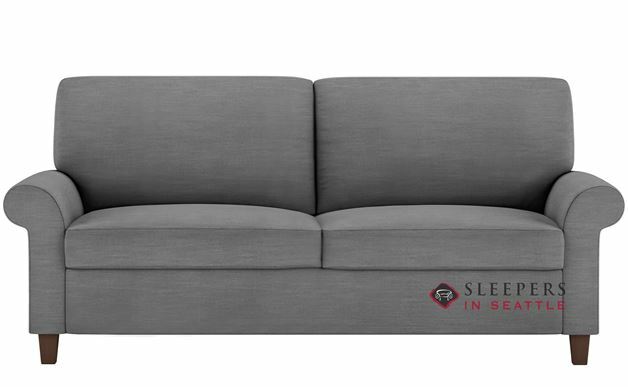 If you or someone you love is going to be using the sleeper as their main bed, than this is really the only sleeper I've used that is good enough. Obviously, I am happy with my purchase!